Working out your wedding guest list should be one of the top priorities for any couple starting to plan their wedding. 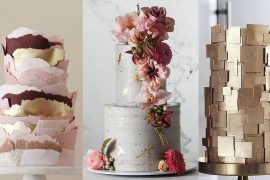 This magic number has an impact on almost everything else about your day – from the size of your venue, to how big your cake needs to be. For each guest, there’ll be invites, chairs, tables, centerpieces, food, drinks, and favours. That is why making a guest list is one of the first to-does in your wedding checklist. All of those things cost money, so you want to be sure you’ve got your wedding guest list on point. Before you starting filling pages with names, talk to your partner about what you want at your wedding – is it a huge party with all your friends, all your family, and a few more in between, or do you want an intimate celebration with only your nearest and dearest? 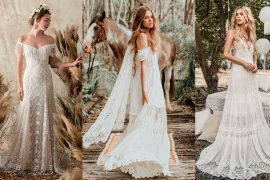 Is your dream ceremony with just close family and best friends, or is everyone there for everything? Work out your priorities, then you can plan and budget to get the best fit. If you’ve already got your heart set on a particular venue, this will give you a maximum cap, but think about whether you want to factor in a bit of breathing and dancing space – a venue at full capacity can be too much. If you’ve not found the venue yet, look at your budget and balance that with how you want to feed your guests, and in what kind of surroundings. This will give you a realistic picture of how many people you can afford to have with you, and put a max on your guest list. Almost 17% of brides regret sending out too many save-the-date cards, before they’re sure of their final numbers and who has made the cut. Once you’ve sent those cards out, you’re going to feel obliged to invite every single one of those people to your wedding, so firm up on numbers and get your list right first. It might sound harsh, but you’re going to need to prioritise the people in your lives. The A-list should be the people you absolutely, 100% want to celebrate with you – your immediate family, the cousins you’re closest to, the friends you see all the time, and those you have the closest relationships with. These should be the people you celebrate all of life’s events with, and the ones you can’t imagine celebrating without. Your B list is for more distant family, friends, and co-workers who matter but aren’t top of the list, and for family friends or parents of your best friends, who have been a part of your life for a long time. If you both have big families and know a lot of people, you may even have a C list of potential guests! Once your A-list has had their invites and time to RSVP, you’ll know how many spots you have open to people from the B list, and can send out a new round of invitations accordingly. It’s easier to cut your guest list down if you set out some rules from the beginning to guide you later on. 🙅‍♀️ No kids allowed. Kids or no kids is a very common dilemma, but honestly, most couples have a preference. Don’t feel bad if you choose to have an adults-only wedding, but do be prepared to get a couple of negative RSVPs if some parents struggle to sort childcare. 🙅‍♀️ If one of you has never heard their name, they don’t get an invite. 🙅‍♀️ If you’ve not spoken to them in 2 years, don’t invite them. 🙅‍♀️ No guilt trips – if they’re not one of your close friends, but know a lot of them, they don’t get an invite by association. Decide if you’re going to be generous or minimal with the +1 invitations. If a friend has been with their partner for more than 6 months, and you know them fairly well, they probably get an invite. If it’s a new relationship and you’re not sure how long it’s going to last, they probably won’t. Equally, if you have a large group of friends who know each other, you could choose to invite no plus-ones, knowing that the group will have a great time together, without their partners. If your parents are contributing to the cost of the wedding, they will expect to assign some invitations to their friends. If this is the case, it’s important to set out from the beginning how many people they can invite, and if they need to stick to the rules you have for the rest of your guest list. You don’t want to be meeting people for the first time on your wedding day, so asking that their guests are at least known to you before they show up, is reasonable. If they’re pushing hard for more places, remind them that every guest has associated costs, and ask that they cover the extra expense of the extra people they want to invite. 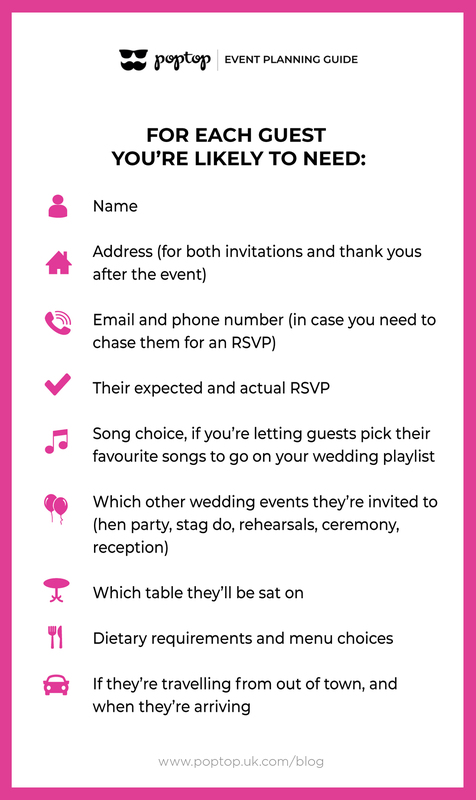 To manage your wedding guest list, you’re going to need a spreadsheet – you’ll be surprised how much information you’re going to need, so believe us when we say to start with a proper document! Download our free template here. Set out your expectations and get yourselves organised, and arranging your wedding guest list really doesn’t have to be too stressful. Good luck!